This year, a controversial book has been published and caused a ruckus in the Christian media scene. 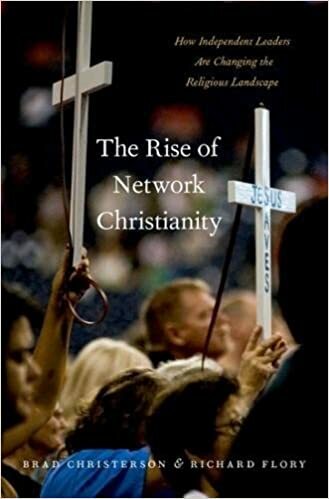 The book is called, ‘The Rise of Network Christianity: How Independent Leaders Are Changing the Religious Landscape’. It was written by Brad Christerson and Richard Flory. Sadly, judging by how they came across in an interview advertising what their book was about, it appears their research into this topic was very poor. The label for this movement did not summarize its identity and purpose the way Wagner did in his titles ‘New Apostolic Reformation’ (NAR) or ‘Post denominationalism’. Instead of calling it what Wagner called it, the NAR, Christerson and Flory decided to call the movement the “Independent Network Charismatic” (INC). That’s the NAR in a nutshell. Largely behind the scenes, a group of mostly self-proclaimed “apostles”, leading ministries from North Carolina to Southern California, has attracted millions of followers with promises of direct access to God through signs and wonders. At one point Christerson even mentions the NAR as though it is a thing in the past. While the book may have been reasonably researched, more damage has been done by their sloppy work in deciding to categorize this movement as something other than the NAR. In saying this, what Christerson and Flory did was highlight the dangers of the ‘apostolic ministries’ of Mike Bickle, Bill Johnson, Cindy Jacobs, Chuck Pierce, and Ché Ahn. Keep in mind that these are all NAR Apostles. So who do you think might suddenly pop up to DEFEND these people? The interview itself mirrored the questions from the Christerson/Flory interview. But in this section of the article we will be focusing on Brown’s lies and what he holds and defends to be true. By Brown saying ‘what’s been called ‘, is to imply that his friends have been categorized by those outside of this movement as NAR. This is probably the most duplicitous campaign Brown has been pushing since his ‘So-called NAR’ radio show last year. Most of Wagner’s friends like Che Ahn, Bill Johnson and Cindy Jacob (also Brown’s friends) had no problem with this name being attributed to them – and some, like Heidi Baker still don’t have a problem to this date. The truth is this – Lou Engle and Che Ahn were serving under Wagner. Wagner was their overseeing apostle. Wagner’s ‘International Coalition of Apostles’ (ICA), back in 2001 records Che Ahn being under Wagner’s apostleship. Therefore, ‘The Call’ was under the NAR umbrella. For Brown to be working for ‘The Call’ and to be on the board, places him working under Wagner. Wagner was not only the leader of the New Apostolic Reformation, Wagner coined the term. He was very vocal about his dominionist agenda, dominion mandate and Seven Mountain mandate in all his books, sermons, workshops and online/offline videos. This is an important to know when we examine LIE 4. And other NAR leaders muddle their views even more than Wagner does. They claim that they are still premillennialists and that somehow their NAR teachings can be reconciled with premillennialism. For example, Mike Bickle–the founder of the International House of Prayer (IHOP) in Kansas City, Missouri–teaches his own NAR variety of premillennialism that he calls “historic premillennialism.” Actually, Bickle’s use of the term “historic premillennialism” is misleading as his teaching does not accurately reflect historic premillennialism. Rather, it is more of a hybrid of postmillennial and premillennial views–and the result looks much more like postmillennialism. See Bickle’s odd hybrid teaching here. Yet I don’t believe NAR teachings can be reconciled with premillennialism, no matter how hard the Mike Bickle’s of the NAR world might try to reconcile these views. But I will have to say more about this in a future post. “These ideas [are] normally put on us from the outside — when I say us, I mean those who believe the church is supposed to impact the world around us. Their claim is that the church is going to ‘take dominion’ over all areas of society: over the arts, business, and so on. Furthemore, Brown has no shame promoting his friendship with NAR Apostle Lance Wallnau. Wallnau’s major emphasis in his ministry is the Seven Mountain mandate. Brown is also unashamedly good friends with Rick Joyner who also teaches dominion theology. So Michael Brown is blatantly lying without caring for the truth in the slightest in this interview. Michael Brown wants us to believe his good friend Mike Bickle “is devoted to Scripture” and has had “in-depth discussion of Scriptural exegesis” with him. In fact, Michael Brown confessed in this piece he works with Bickle. When you look at the Bound4LIFE website, they are promoting the Seven Mountain mandate (only this time they are calling them Spheres – another name NAR use for this mandate). So much for Brown working with people who don’t peddle the NAR false mountain mandate commission. And so much for him not being part of the NAR. In his protest in defense of the NAR (that didn’t exist), he put himself, his ministry, Brownsville, his schools and those he closely worked with, right in the middle of it. To end, we want to highlight the truth of Brown’s NAR nature by quoting sections of the article which espouses the NAR ‘Power Gospel’ (aka Gospel of the Kingdom). This false gospel does not involve preaching the gospel of salvation but emphasizes signs, wonders and miracles. This ‘miracle’ gospel rose to prominence in the ‘New Order of the Latter’ cult, espoused by William Branham and his plethora of healing evangelists. Michael Brown would get a seal of approval from William Branham and C. Peter Wagner with the above gospel presentation they also preached. If Michael Brown is a Christian and the NAR does not exist, why is he preaching their ‘gospel’? Why do many Christians continue to endorse Michael Brown when the bible explicitly states to watch, mark, avoid and tolerate such men? This article has barely scratched the surface, exposing Michael Brown’s deceit. We have led with this article so we can refer back to it in order to demonstrate how Brown blatantly lies to bolster his fabrications that the NAR is a figment of the imaginations of discerning members of the body of Christ who continue to sound the alarm about this cult. ‹ Bethel endorsing occultists in ‘sheep’s clothing’ – insight given by an insider from Christalignment.